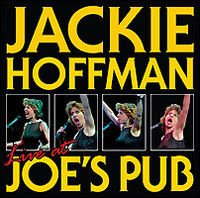 I'm a big fan of Jackie Hoffman. I've seen her holiday show that runs at Joe's Pub in NYC a couple of times and I literally peed in my pants. I know that's gross, but she is that funny. While she may not be the biggest star (and she should be) you may recognize her from Kissing Jessica Stein or have seen her on Broadway in Hairspray and Xanadu. She's taken some of the material from her recent shows and put them on a hysterically funny CD which is out now. Purchase her CD here. She can be seen at Joe's Pub in NYC on December 22 and January 5. Info here. Women & Hollywood: You're back at Joe's Pub in NYC for another edition of your anti-holiday show. What is it about the holidays that brings out the worst in you? Jackie Hoffman: The hypocritical obsession with all things warm and fluffy and children. The music that is shoved down my throat everywhere. If you've seen my show, I think you'd say that it brings out the best in me. W&H: Your comedy is hysterical and bitter. Where does that come from? JH: Right? My theory is all the taunting at the playground, and growing up the overweight girl with the big nose and crossed eyes. W&H: You've been on Broadway in Hairspray and Xanadu. Any more shows on the horizon? W&H: On your CD you make fun of your health issues. Tell us why you make fun of your fibroid and scare with cancer. Because the irony is just too perfect. Someone who has the courage to speak out about not worshipping children, and then getting a gigantic tumor that resembled a pregnancy, and being rendered infertile. I couldn't not talk about it. W&H: You love to make fun of the Jews without making Jews feel defensive (which is hard). Why are the Jews such fodder for your comedy? JH: Thank you. I just do what writers do, go with what I know. I was raised by and with very funny Jews. And some of the attitudes and characters that I've come across in my life are too good to pass up. W&H: What's next for you? JH: I am taking my act on the road to different cities to promote this album. There is nothing like it out there, and I'm very proud of that.